How to integrate a Mailman sign-up with your web site? There are many people who prefer to read selected news items over following 10-30 sources of information. Lot's of us prefer e-mail alerts over RSS feeds. During the week-end I setup two newsletters. 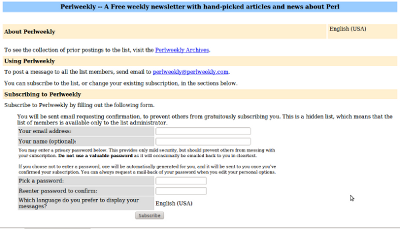 One is called Perl Weekly sending out a list of the most important news items and articles regarding Perl. The other one is an announcement list for my own website. This is for people who would like to get notified when I upload a new post. For now they are both Mailman based mailing lists as that was the easiest to setup without giving up control to a mailing company. It could be customized but it still means people need to do extra steps before they can sign up to the newsletter. The first thing I did for better integration is to embed the HTML form that is on the mailman page into my web site but only show one field for the e-mail address. If you try that form an click on the button you will see that the result page is still what Mailman provides. What about changing that too? Now when the user clicks on the Sign Me Up! button, the above script will serialize the data in the form and send a GET request to the mailman subscribe form. When that replies the JQuery code will load the thank you page with further instructions. It still leaves the ugly e-mail that Mailman sends out and the verification form but at least the first step is more integrated in my website. I am not a JQuery or HTML expert. I am probably better described as a newbie for life. There might be much better ways to make this happen. How do you integrate e-mail signup to your website?